The Jeep TJ Wrangler. Great Writeups. Great Info. If you live in a cold climate in the frigid northern reaches of Canada like I do, you may have experienced some issues with your shifter being stiff in the winter. It might even pop out of gear due to the rubber shifter boot becoming quite stiff. This mod is for you! I did this on my 2003 Jeep TJ, and 2005 and later TJs come with the shift boot already installed. Older TJs can be done the same way, but the console is a little different, so you may not be able to follow this step-by-step. I picked up a new shift boot for a 2005 TJ from the dealer for about $40 CDN. If you haven’t guessed, this is only applicable for manual transmissions. I’ll admit that it’s not real leather… but it feels and looks the part. 1: Begin by taking apart your shifter. The cap on the shift knob with the shift pattern can be taken off with a flat blade screwdriver. It will mark up the outside a bit, so be careful you don’t mark it up too much. 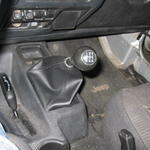 2: Remove the nut holding the shift knob on. I forget what size it is, but if I had to guess I would say somewhere around a 15mm socket. 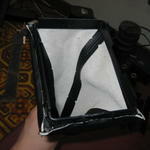 3: Remove the shift boot. It’s holding onto a plastic retainer of sorts that clips into the console. If you use your flat blade screwdriver and insert it at the very front where the shift boot touches the console, you can deform the plastic back towards the rear of the jeep and lift upwards. This is a little hard to explain, but if you view the full size image for this step you can see the clips that I am talking about. Just take your time and don’t put too much pressure on it and you will be fine. 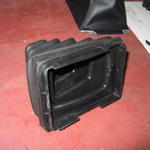 4: Now that we have it out on the workbench, go ahead and remove the rubber boot from the plastic retainer. It just wraps around the edges and can be pulled off. You can also now remove the clip that holds the boot up on the shifter fork. Just remove it with your flat blade screwdriver, we won’t be needing it. 5: Now comes the tricky part where you need to think for yourself a bit. 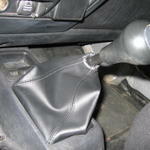 The shifter boot for the 2005+ Jeep TJs are attached to a steel base, you can go ahead pull the boot off of that. They have a larger base so you will have to cut it down to fit the plastic retainer from your shift boot anyway. I can’t give you measurements for this, so you will have to do some thinking and a lot of trial and error. 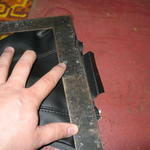 Start by cutting off the uneven parts of the leather boot with an exacto knife and a straight edge. You can see me doing this in the image for this step. 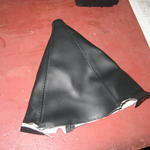 6: Once you have the leather shift boot looking how you want, we’re ready to start gluing. If you’ve managed to get the fit right it should fit over top of the plastic retainer, and reach around the bottom of the top lip. It will look something like this image when glued. I made mine a little tight and it needed some stretching to fit, hopefully you do it better. 😛 To glue it, start by laying a small bead of hot glue on the underside edge of the plastic retainer, and glue one side down. Once you have that, continue on to the other three sides until it’s glued down on all four sides. The corners won’t want to stay down, but that gets hidden pretty well once the plastic retainer is inserted back into the console. 7: Once the glue dries and you have it looking snazzy, go ahead and insert the boot over top of your shift fork, and clip the plastic retainer in it’s place. You might need to use your flat head screwdriver to push those corners down a bit, but once it’s all in place it will look better than you expect if you did a good job on the fitting. 8: Now that we have that all back in place, go ahead and run your shifter through the gears to make sure the boot is going to stay upright enough for your liking. If you prefer to have that clip on the fork to keep it at a certain height, go ahead and reinstall it. Keep in mind that the clip should be installed at the height the boot sits in reverse. This is the point where the boot is stretched it’s farthest. 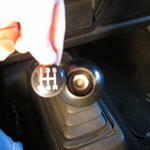 Reinstall your knob, re-attach the bolt, and pop that shift pattern cap back in. VOILA! I have had this mod done on mine for about a year and a half now, and it holds up perfectly. I have gotten mud all over it, pressure washed it several times, and it still looks like brand new. It shifts smoothly through all gears with no resistance in any weather, and looks great to boot! Sorry about the pun.